The Sega Dreamcast had many promising games canceled near the end of it’s lifespan such as Propeller Arena and Half-Life. 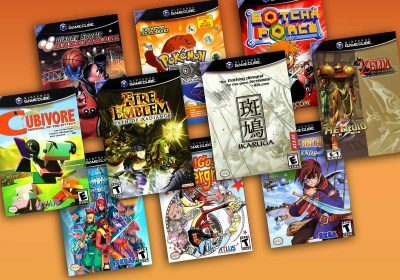 However, there were also some lesser-known games at the beginning of the Dreamcast’s launch that never saw retail shelves. There is one particular game by the name of “Drones”, that I had never even heard of until just recently. Apparently, Drones was very far into development before the Dreamcast was even launched. There was also an arcade and PC version slated as well. From the research I have done, I have not been able to find any trace of release information for any of the platforms. I also cannot find any information on the developer, NIGMA Software. Seems a little fishy, but I can’t help but be intrigued anyway. Anyway, I ORC’d the inteview with NIGMA Software from the October 1998 issue of Official Sega Saturn Magazine (UK) in addition to pulling the screenshots included in the article (see them in this Flickr set). 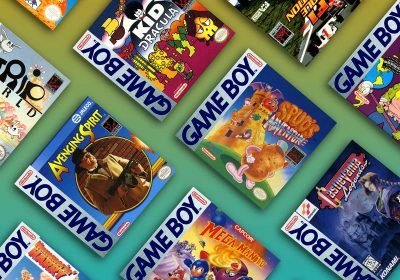 “Sources within Sega have remained tight-lipped with regard to the Dreamcast, yet outspoken third party developers are giving our readers the inside line on this wondrous 128-bit console. This month, SEGA SATURN MAGAZINE has managed to secure an exclusive interview with one such developer, European-based NIGMA Software, currently working on an incredible new arcade fighting game, with PC and Dreamcast versions to follow. Game Designer, Producer, Project Manager and all-round top bloke, Alex Lemedy, speaks candidly with SSM: about the spectacular Drones! SSM: What projects has NIGMA been previously involved with? AL: No game projects. However, we’ve been (separately) involved in many aspects of the videogame industry (development, press, design, marketing) Drones is actually our first full size videogame. SSM: How many staff are working on the Drones project? AL: At present we have Giovanni Caturanno, Carmine Della Sala, Lorenzo Canzanella and myself, Alex Lemedy. We also have additional collaboration from Adriano Avecone and Stefano Chiabrera. Eleven people will be working on Drones during full time development. SSM: When did work on the Drones project begin? AL: I began the design of Drones in 1984! But NIGMA developers started working on it in November 1997. All we have done at this time is the result of spare time work and is the equivalent of two months full time development. 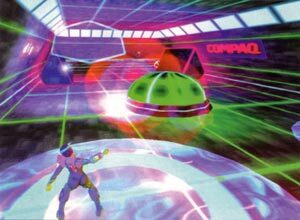 SSM: Is the Disney computer generated movie, Trots, the inspiration behind the Drones game? AL: Yes. Drones is based on the 1983 arcade classic game Discs of Tron from Bally/Midway. It’s not a copy though. I just took the gameplay basics, extended them in a great way and added tons of new features. However, we do intend to keep the ambiance of the Tron movie – electric neon glowing style. SSM: What are your basic aims with Drones? AL: The main aim is to bring people a new kind of gameplay, radically different from standard games. We hope to achieve this without having to sacrifice the technical and visual parts which will be unique too. Drones features technical stuff never seen before in videogames, whatever the platform. 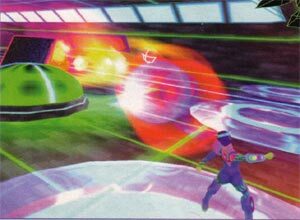 In addition to including, developing and enhancing the awesome gameplay seen in Discs of Tron, I wanted to be true to the Tron movie look – electric neon glows and light rails. For these effects, NIGMA programmers created an incredible proprietary 3D engine with never seen before features. Players will be treated to an impressive visual show, especially the lighting. Even in today’s stage of development, our 3D engine is more powerful than that of the PC Unreal [all but confirmed for Dreamcast – LEE] and includes many features that the Unreal engine doesn’t have. SSM: So how does Drones compare with say, Tekken or VF3? AL: It’s just not the same kind of game. Drones is a futuristic sport which people play for the title of World Champion. In the near future, network gaming becomes predominant and at the same time, development of new user interfaces reaches the ultimate point interface doesn’t involve any surgical intervention, but rather a mundane helmet with micro sensors, sensitive to the human brain’s alpha waves. Thus allowing the player to control the game by thought alone, bypassing the delay caused by the use of hands, feet and fingers. In this way, people are connected to the Drones network where they are represented by their virtual avatars – the Drones. They are then pitted again other peoples’ and AI controlled Drones. It then becomes a mix of tennis and combat games, where people fight each other with thrown weapons. SSM: Snooker cues, broken beer bottles, handbags? AL: No, rather stuff like frisbees, energy bolts, darts and shurikens. The game will of course feature many weapons, shields, tools, special moves and a lot of characters. When I say a lot of characters, I really mean it, because this will be one of Drones’ many unique and original features. To summarize it quickly, the computer AI will keep track of and record the way people play and draws a ‘robot portrait’ of them (including their personal manners, behaviors, special way of attack, preferred weapons and defense). Therefore players will have the option to allow the computer to use this for the first time in videogames’ history, the opportunity to play against ‘yourself’ or against your friends or any people’s images. That’s also why the game itself is called Drones. Today games like Quake have their longevity extended by the ability to add their own custom maps and levels. With this feature, Drones will prove a new unlimited database of characters as well, in addition to all new levels (maps/arenas). There’s also a strategic aspect induced by thrown weapons. 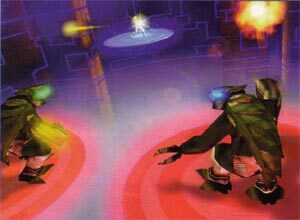 For instance, players have the choice of either shooting directly at their opponents, or using wall to hits an enemy with ricochets, just like in a pool game! 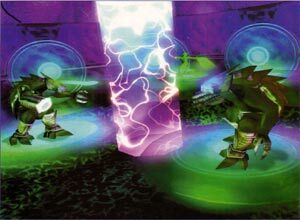 It’s also possible to use the environment to defeat your enemy, by destroying the ceiling above an opponent’s head, burying them under debris. SSM: How does one of these ‘arenas’ differ from the next? AL: Levels differ by the following features – geometry (arena architecture and lighting), the objects that populate that environment, the number of platforms (the circular objects on which players stand) which defines the mobility of the players, booby traps, number and nature of weapons, shields and bonuses found in the area, presence of a ‘big boss’, the number of human/CPU enemies and many other such features. SSM: Can you tell our readers a little about the arcade hardware used for Drones? 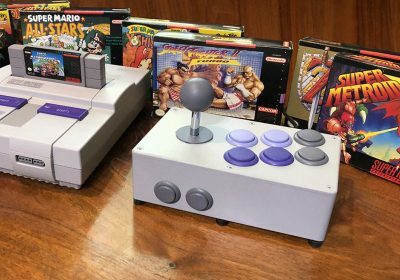 AL: Initially our goal was to manufacture our own custom arcade hardware cabinets powered by DEC Alpha hardware (Alpha CPU, mother board and Open GL card) running a light version of Windows NT. This solution is far more powerful than Model 3, but at this time I’m not allowed to give you details on the exact performance and price. This all depends on many factors, prices of the DEC hardware for example, and Microsoft’s conditions for using a light version of Windows NT. SSM: So what prompted NIGMA to start porting Drones over from the arcade version to the Dreamcast? SSM: Feedback from third party developers has been very positive with regard to the Dreamcast hardware. What is your feeling about the machine? 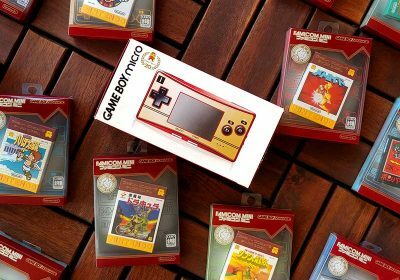 AL: Well, the hardware features are quite impressive and with an incredibly low price…. The only relevant thing I can say here is that NEC’s Power VR second generation was a really good choice by Sega! This technology works wonders! SSM: How easy is it for you to port Drones over to the Dreamcast? AL: Extremely easy. In fact, the way I had Drones developed from the beginning is for adaptability. Adaptability to hardware and/or operating system. My idea is not a new or brilliant one, I simply used the Formula One cars principle: supply my programmers with a very high-end platform to develop the game on, thus allowing them to try and test new ideas and concepts. 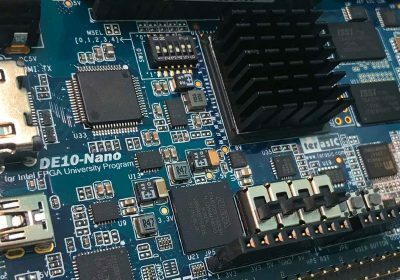 And once they have them working, they can analyse how what they created works and find the way to port it to a different environment, hardware or software. Thanks to that, and most importantly NIGMA’s programming talent, Drones will take advantage of all the platforms it will be ported to. SSM: So will the Dreamcast version look as spectacular as the arcade version of Drones? AL: The arcade version will be the most spectacular one (as it takes advantage of all and any hardware features). But the Dreamcast specs promise an astounding Drones conversion for sure. S5M Are you planning to incorporate the VMS device somehow? AL: Yes, of course. Characters will progress in Drones, gaining strength, speed, weapons, shields, tools, special powers and moves. Saving a Drones character is a must for the gameplay. SSM: The four buttoned Dreamcast pad appears unsuitable for beat ’em ups, especially Capcom’s. What are your feelings? AL: We’re working on this and have already found many ways to adapt Drones’ gameplay needs to Dreamcast controllers. I didn’t initially like the Dreamcast controllers, but you get used to them surprisingly quickly… In fact we’re working on it now, and will decide exactly how Drones will take advantage of the Dreamcast controllers in one or two months. It’s not been set yet. SSM: How far into development are the arcade, PC and Dreamcast versions of Drones? AL: Very advanced. From a pure technical point of view, Drones could be completed 100% on one platform by Christmas and 80% on another whatever the platform [given the Windows operating system on both arcade, PC and Dreamcast – LEE) Now the release of Drones will depend on marketing issues. SSM: So are we likely to see a Dreamcast version in time for the Japanese launch in November? SSM: But what about the European launch next Autumn? How feasible is that? AL: From a pure technical point of view, Drones will be ready well before the European Dreamcast release. But a Drones release, whatever the platform, will depend on our publisher’s marketing plans (we’re still negotiating with several publishers). SSM: Are you planning to use Dreamcast’s networking capabilities for multi-player games over the Internet? AL: Of course. In fact the multi-player game is a fundamental part of Drones. It will be multi-player via LAN/WAN and the Internet (TCP/IP modem-modem connection or through servers). But one of our aims is to allow people playing Drones at home on the Dreamcast to play against people in arcades and on their PC, via the Internet. And TCP/IP is the basic protocol for Drones multi-player mode. SSM: You’ve hinted in various interviews on the Internet that you’re interested in producing a Dreamcast RPG. Is this the case? AL: Yes, we love RPGs. But it’s too early to talk about that. SSM: Do you have any other Dreamcast projects in development that we should know about? 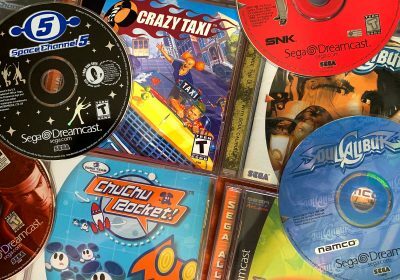 AL: We have many other Dreamcast projects, but I can’t tell you about them just yet. SSM: When are you planning to show off the arcade, PC and (most importantly) the Dreamcast version of Drones? AL: In may happen at ECTS [at London’s Olympia this September-LEE], but that will depend on our publisher’s marketing policy. On the other hand, I can tell you that Drones will be displayed running on the Alpha arcade hardware at EUREKA (the 25th annual DEC users forum) in Paris on the i7th of September this year. SSM: Finally, how do you rate Sega’s chances of global success with the Dreamcast? Sounds quite impressive and ambitious, doesn’t it? Looking back with hindsight, it seems as if they wanted to do a number of things that were way ahead of it’s time. For a developer that didn’t have a full game under its belt, it sounds like they got a bit ahead of themselves. So what happened to Drones? Well, they mentioned they were trying to line up a publisher, so maybe it just never got past that point. And perhaps this small developer just folded up after putting so many resources into a project with no reward. Anyway, if anybody out there has any clue about Drones or it’s developer NIGMA Software, please let me know, I’d love to hear any additional information about it. Yeah, it definitely sounds as though they bit off more than they could chew. I’m not at all surprised that this game never saw the light of day. It’s interesting to read their comments on Dreamcast from that period of time, though. Ahh…never mind. I just noticed in your previous article’s comments that it was released as Dronez on Xbox. Wasn’t this released in Europe for the Xbox? I played the game, it was fun. So they turned it into a shooter? It looks almost completely different than this original preview. That must be why it took another 4 years. The developer they list isn’t the same either. Must be why I couldn’t find the original one anywhere. 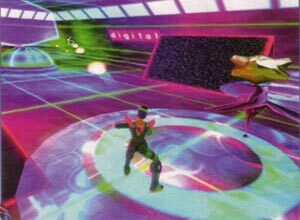 I don’t know about you, but I’d rather have the Tron-like game. Doesn’t really look like a “shooter” to me, exactly; still rather Tron-like. But yeah, differences like that are what happen when games get bought by other developers. Kind of like how a movie changing hands can change it into something totally different. I looked up one of the guys listed in the interview, and he works for a developer called Spinvector (http://www.spinvector.com/). That site is quite interesting, says it was released on PC in Russia as well as Xbox in Japan. wow — nice find, Grumbler! SaurianOverlord, it’s not a “traditional shooter”, but even reviews of the game call it one. The final product had you going from room to room shooting baddies. The original concepts was more like a one-on-one sports/fighter hybrid. You call also see a difference in the colors and overall style of the games. The original concept looks extremely Tron-like, whereas the final product looks like you average futuristic shooter. Here’s a trailer for the arcade version, at that point the developers were called Zetha, but the credits list the people in this interview. Apparently it was part of some ATi video card deal at some point as well. As per the above comment, Zetha released a tech demo of the engine years before the game came out on the Xbox. I kept tabs on this one for years, since it was supposed to be Tron-like. The final game wasn’t too bad, actually… but it was less Tron-like than I had hoped.